Wheat can be a bummer. While we are not a dedicated gluten-free establishment (i.e. we bake with wheat flour, as well as oats), we do offer a small selection of gluten-free items. Our GF products are always prepared with caution and care. We sterilize equipment and use distinctive marking and packaging. 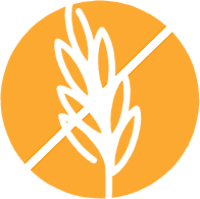 Please keep in mind that there is flour in the air and that there will be trace elements of wheat in all of our products. All of our buttercream frostings are gluten-free.